Recita­tion by Thor of a bal­lad poem by Australia’s best loved storyteller. 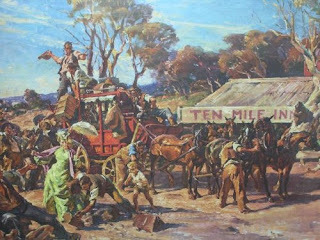 The set­ting is west­ern New South Wales, Aus­tralia, in the late nine­teenth century. You can see the words on this site . Paint­ing by Ivor Hele . Wel­come to this cor­ner of cyber­world. Here I’ll be post­ing var­i­ous kinds of voice media, and per­haps a bit of video stuff. For the world of print see http://thormay.net/ , oth­er­wise known as The Pas­sion­ate Skep­tic site, which has hun­dreds of my arti­cles, sto­ries, poems etc. There’s quite a bit of pho­tog­ra­phy there too. - Com­men­taries — Poet­ry read­ings : my own poems and oth­er poet’s cre­ations. Of oth­er poets, expect some stuff in the bal­lad tra­di­tion which is not only fun to recite but is great for Eng­lish learn­ers try­ing to pick up the rhythms of the language.